Surrounded by Hopewell Township on all sides, Pennington Borough is a charming small town measuring just under one square mile, and this year celebrates its 125 year history. At its heart is a downtown that’s home to an assortment of unique, privately owned shops, salons and eateries, all of which contribute to the town’s Rockwellian charm. A single traffic light manages the flow at Main Street and East Delaware Avenue. New Jersey Family magazine just named Pennington the #1 Best Town for Families, topping every town in the state (over 500) for the honor. Nearby is the town supermarket, Pennington Quality Market, a family owned institution since 1960 that features a bake shop, deli, florist, butcher, produce and groceries, plus a seasonal farmer’s market. And Kerr’s Kornstand, a family run retail produce stand at their farm on Pennington Rocky Hill Road, draws raves reviews for their main crops: sweet corn and Jersey tomatoes. 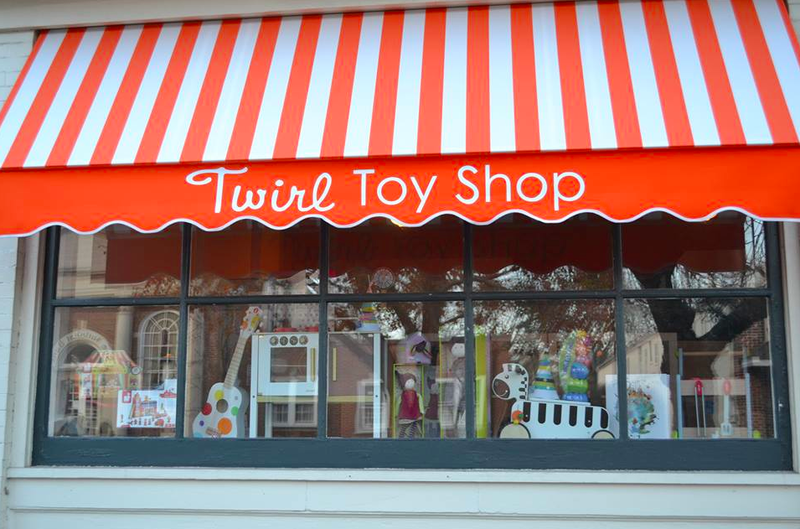 Twirl Toy Shop. Main Street Pennington. An annual, not-to-be-missed event is Pennington Day, which began in the 1980s and usually occurs in mid-May. Part street festival, part block party, it’s an opportunity to enjoy music, a parade, kid-friendly activities, and booths set up by crafters, health care practitioners and local civic groups. Pennington Borough is part of the Hopewell Valley Regional School District. Students in grades K-5 attend Toll Gate Grammar School; grades 6-8 attend Timberlane Middle School; and high schoolers attend Hopewell Valley Central High School, which is located in Pennington. Also in town is The Pennington School, a private, co-educational school which serves students in grades 6-12, and offers use of its indoor swimming pool to members of the community for a fee. For commuting convenience, Route 31 passes through Pennington and provides quick and easy access to Interstate 95.